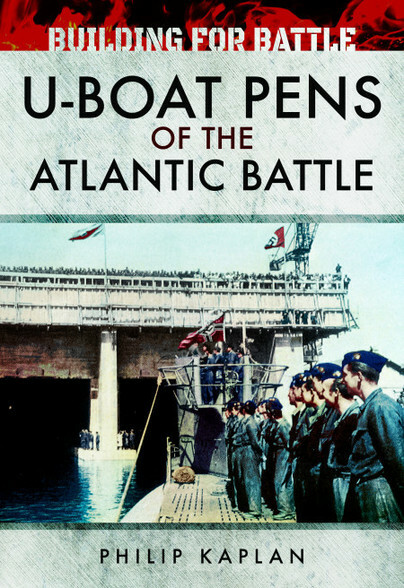 You'll be £25.00 closer to your next £10.00 credit when you purchase Building for Battle: U-Boat Pens of the Atlantic Battle. What's this? The only thing that ever really frightened me during the war was the U-boat peril - Prime Minister Winston Churchill. Churchill, as a former First Lord of the Admiralty, was well versed in the importance of Britain protecting itself at sea. In the opening years of the Second World War, Germany’s U-boat (submarine) fleet was tasked with attacking and destroying the supply ships that Britain depended upon for its survival. The U-boats were under the command of Grand Admiral Karl Doenitz who, for much of the war, effectively guided that strategy. There was a very real possibility that the British people would starve if the U-boats succeeded in their campaign. When France fell to the German forces in 1940, Hitler’s Ubootwaffe gained a significant asset in five important ports along the Brittany coast - Brest, Lorient, St. Nazaire, La Palace and Bordeaux. The use of these ports put Germany’s submarine force hundreds of miles closer to the action in the North Atlantic, the routes of the Allied supply convoys which were operating mainly between Halifax, Nova Scotia and various English port cities. This afforded the U-boats several more days at sea on their deadly patrols than was possible while they had been based in Germany and German-occupied Norway. In this new publication from Philip Kaplan, the massive bunkers or ‘pens’ constructed in Brittany by the labourers of the German Organisation Todt are revisited. These giant structures, some of which sheltered more than a dozen submarines at a time, still exist because they were built with concrete ceilings more than three metres thick. With equally impressive supporting walls, they suffered relatively little damage in the wartime bombing raids of the Royal Air Force and the US Eighth Army Air Force. Illustrated with more than 150 rare and compelling photo images, this book is a richly rewarding journey back across time to some of the most intriguing and electrifying sites from the war years. The story of the pen shelters and their part in that war is both fascinating and enduring. A new addition to the Pen and Sword series of Building for Battle, looking at the battle of the Atlantic, the U-Boat war, and the role of those huge concrete pens that were built on the French and Norwegian coasts. It splits the story across 9 chapters, starting with The Beginning, looking back at WW1 when pens were first used to protect the German U-boats in port, though facing only the small bombs used in WW1, they were much less impressive constructions. When it came to WW2 the lessons had not been forgotten, though the changes in the technology, the bombing threat, the new pens were massive reinforced concrete structures, built to withstand heavy attacks. Then it moves on to Early Days; The Type VII; Brittany Bases; Captains; U-Boat Routine; Bundles for Britain; Under Attack; and The Last Act. The book gives a good view of the importance to the U-Boat arm of the French coast. It significantly shortened their journey from port to the Atlantic battleground. The huge concrete pens provided protection to the boats themselves, along with workshops, weapons stores and accommodation for crews and maintenance workers. Alongside the importance of the pens to the crews, the books tells us about three of the most famous U-Boat aces, and their different fates. It's also about the allied anti-submarine campaign and how the success against U-Boats at sea had to be considered against bombing the pens, and the impact of collateral damage to the French civilians in the areas around them. Throughout the book there are a lot of photos. Not just wartime archive shots, but also modern colour pictures of the huge concrete pens that remain in place to this day. Modern French submarines can be seen in one, while private yachts are sheltered in another. Dry docks are still there and even the huge Dombunkers and turntable at Lorient. It makes for a fascinating story and focuses on an element which you can still see in place today if you are to visit those French ports at Bordeaux, Lorient and St.Nazaire. Author/historian/designer/photographer Philip Kaplan has written and co-authored forty-seven books on aviation, military and naval subjects. His previous books include: One Last Look, The Few, Little Friends, Round the Clock, Wolfpack, Convoy, Fighter Pilot, Bombers, Fly Navy, Run Silent, Chariots of Fire, Legend and, for Pen and Sword, Big Wings, Two-Man Air Force, Night and Day Bomber Offensive, Mustang The Inspiration, Rolling Thunder, Behind the Wire, Grey Wolves, Naval Air, and Sailor. He is married to the novelist Margaret Mayhew.